The following is the 2019 schedule for the Tucson Sugar Skulls. Tucson is one is one of two expansion teams joining the Indoor Football League beginning the 2019 season. 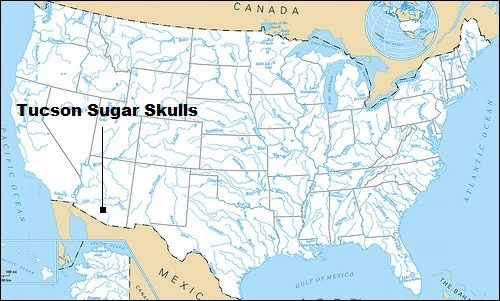 The Sugar Skulls were introduced as a franchise on August 23, and are owned by Kevin and Cathy Guy. Kevin Guy is also the head coach of the Arizona Rattlers. The Sugar Skulls will be run by Cathy Guy and executive director Mike Feder. They will be the southern-most IFL team. The Sugar Skulls open their inaugural season in Week 2 as they pay a visit to the fellow expansion San Diego Strike Force. Their home opener is the following week when they host the Bismarck Bucks. They have a single home stretch of two games and a single road stretch of two games. They go nine weeks without a bye week in the middle to latter part of their season. They conclude their season at home against the Quad City Steamwheelers. The Sugar Skulls play the Rattlers and Strike Force four times each. They will not face the Cedar Rapids River Kings, the Green Bay Blizzard nor the Sioux Falls Storm this season. Each IFL team plays 14 games (seven home and seven away), and has three bye weeks. The Sugar Skulls' byes come in Weeks 1, 5 and 15. They play their home games at Tucson Convention Center at Tucson, Arizona. Marcus Coleman is the Sugar Skulls' head coach. All Sugar Skulls games will be broadcast locally on the radio and will be available for streaming through those stations. SCtoC will provide links in its previews of the games, as well as recaps of each IFL game. All IFL games are available to be streamed on video via the IFL's YouTube channel. Below is the Sugar Skulls' 2019 schedule. Home games are noted in bold black. Times and dates are subject to change. All times are pacific. Click on the final score to get the boxscore of the game, and click the Recap link to access SCtoC's original recap of the game. Week 10 -- Sat., April 27 - Iowa Barnstormers, 6 p.m.
Week 11 -- Sat., May 4 - San Diego Strike Force, 6 p.m.
Week 12 -- Thr., May 9 - at San Diego Strike Force, 7 p.m.
Week 13 -- Sat., May 18 - at Bismarck Bucks, 4:05 p.m.
Week 14 -- Sat., May 25 - Arizona Rattlers, 6 p.m.
Week 16 -- Sat., June 8 - at Arizona Rattlers, 5 p.m.
Week 17 -- Sat., June 15 - Quad City Steamwheelers, 6 p.m.